n/a Hebrew. 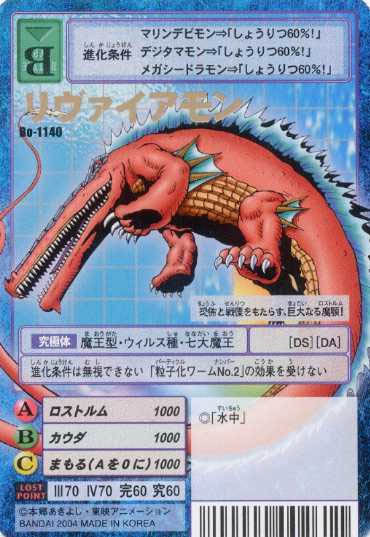 The Leviathan was said to be some sort of massive demon in the shape of a crocodile or a serpent who lived in the sea. In Paradise Lost, Leviathan was one of Lucifer's right-hand demons, a fearsome being who possessed enormous physical strength. Marine Devimon + Win Ratio 80%! Dagomon + Win Ratio 80%! Hangyomon + Win Ratio 80%! N/A - Not Translated At the end of the turn during which you evolved, send this card to the Dark Area. His evolution requirements cannot be ignored. The opponent loses his special powers. When you put Leviamon into play, neither you nor your opponent can use Option Cards or support powers. Marine Devimon + Win Ratio 60%! Digitamamon + Win Ratio 60%! Mega Seadramon + Win Ratio 60%! N/A - Not Translated His evolution requirements cannot be ignored. Has the power of "underwater."